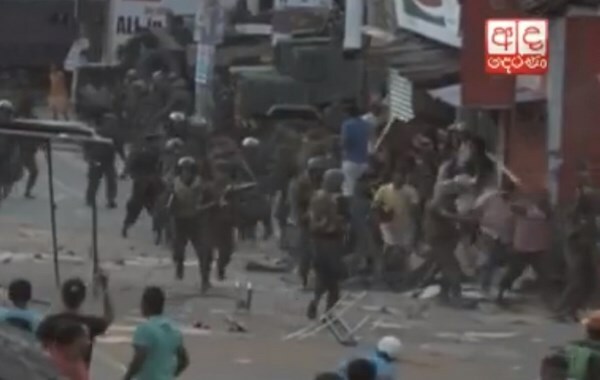 Three men were killed and forty-five others injured after soldiers fired on protesters in Sri Lanka's Gampaha District demonstrating against ground water contamination. On Thursday, 1 August, 2012 more than a thousand people gathered to protest authorities failing to resolve the ground water pollution that has created a shortage of drinking water in several areas in the area. When protesters blocked the main Colombo-Kandy Road at Weliweriya junction, police started spraying water canons and tear gas to disperse them, but called for military reinforcements when their attempts failed. As the army went into action, they prevented journalists and camera crew from covering the clashes and a number of reporters were assaulted. Later it was revealed that during the clashes, soldiers shot at the Church of St Anthony as protesters sought shelter there. The soldiers reportedly threatened the mother superior of the convent at gunpoint, who was protecting the protesters. Details of the incident which took place inside the church are gradually emerging from eyewitnesses. Parish priest of Weliweriya Rev. Fr. Lakpriya Nonis told media that there were gunshot marks in a concrete post and a wall of his church. Catholic priests and nuns launched a protest campaign in Colombo in over the attacks on church in Weliweriya. According to protesters who were demonstrating against the water shortage, the haphazard disposal of waste water from a Dipped Products factory located in Nedungamuwa, Weliweriya was causing environmental and water pollution in the area. Residents of some ten villages in the area took the streets a few days ago led by a Chief Monk of a temple in the area to protest the contamination. However the company rejected the allegations. Sri Lankan Army Commander Lieutenant General Daya Rathnayake has appointed a board of inquiry to look into the incident. An army spokesman said that it will take two weeks to complete the report. The Gampaha Magistrate has ordered a report be completed on the Weliweriya incident. A group of prominent Sri Lankans issued a statement titled “Justice for Weliweriya: Time for Indignation!” to protest the incident. Organizations like the Socialist Youth Union held awareness programme and campaign condemning the ‘brutal attack on unarmed civilians by Security Forces. I can’t sleep. For two days in a row, I woke up at 3 am. [..] Those moving images of armed soldiers and battle-tanks mowing down defenceless villagers at Weliweriya haunt me. In my mind, the events keep merging: What I saw happen at Weliweriya from amateur television footage; and what I imagine might have happened in the North, during those final, anguished months of the army’s war with the Liberation Tigers of Tamil Eelam. Civilians had perished in that battle. In Weliweriya, too, there was a battle. After Weliweriya, things fall a little more into place. Not intentionally, but they do. Our life in Sri Lanka today is like this park: Structured by the State, manicured by the State, guided by the State, controlled by the State and, as sure as Hell, set upon by the State if we trip out of line. The protestors of Weliweriya weren’t terrorists demanding a piece of the country. They were ordinary people demanding a very basic right. The right to clean drinking water. All they were given was blood. The authorities have no one but themselves to blame for this tragic turn of events. Who deployed troops, clad in flak jackets (body armour) and armed with T-56 assault rifles to confront and disperse a crowd of protestors blocking a highway? Who was the ultimate decision-maker? The protestors were not armed, certainly not with lethal weapons. Therefore, no real harm could have come to soldiers in body armour. A ‘clash’ between lethally armed soldiers and protestors with stones and slippers is not a clash that warrants in any way, the use of lethal force. It appears more as though the government is stalling. Buying their time until they come up with some relatively credible excuse with which they can confuse the masses. The Government by its direct action has effectively removed the right to peaceful protest, and thereby any semblance it has so far tried to pretend that we are a democracy.